The cloud forest at El Triunfo, especially between 6800-7000' elevation around and above the clearing, is spectacular. It has multiple layers of vegetation high up into the canopy; perhaps a little of this feeling is shown in the photo (right), which includes Sonja, the El Triunfo ecotourism coordinator in 2002, for perspective. 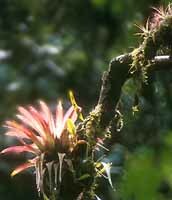 Moss grows on thick limbs and beautiful epiphytes (below) festoon the branches. Jessica Jenner, a tour participant in March 2002, sent me her personal log of the trip which includes this nice summary about the history of protecting this special habitat: "El Triunfo has been established as a Biosphere Reserve. It is mostly evergreen cloud forest ? that is, a dense canopy, often covered by thick mist. Gigantic ferns, big trees covered by lichens, orchids and bromeliads, and scattered here and there are things we think of as “house plants” but big and wild. The region is suitable for coffee cultivation, and there has been considerable logging and clearing of areas for subsistence farms. 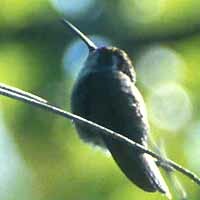 As early as the 1940s there was recognition of the need to preserve El Triunfo because of its unique plants and animals, and in 1972 the Natural History Institute of Chiapas took steps to protect the area. In 1990, the federal government formally established El Triunfo Biosphere Reserve and then in 1993 El Triunfo was included in the UNESCO Program for Biosphere Reserves." In an on-line summary of Mexican parks, Fulvio Eccardi & Cesar Carillo explain that "El Triunfo Biosphere Reserve is divided in five core zones measuring more than 25,000 hectares. A big buffer zone that surrounds the core zones has approximately 90,000 hectares. Management regulations indicate that all kinds of productive or extractive activities are forbidden in the core zones since they are dedicated to conservation and research programs. The buffer zone was established to provide protection to the core zones and to promote sustainable activities in the communities that are into the buffer zone." We are very fortunate that El Triunfo has been protected -- it is a magical place. The photo (below) shows an overview of the clearing at El Triunfo in 2002: now three buildings for research (the back right one is the kitchen & dining room) plus a house where our horsemen stay (foreground). Thick cloud forest surrounds the clearing on all sides with various trails (Finca Prusia trail from which this shot is taken, Palo Gordo trail going out behind the kitchen, various loop trails and others that climb the ridges) penetrate the Reserve to permit one to enjoy quiet walks inside the jungle. 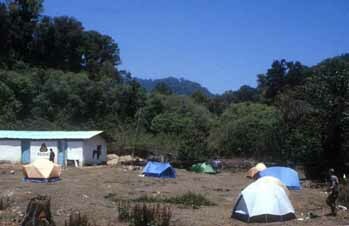 Visiting birders to El Triunfo must camp; the few facilities there now are limited for use to school groups and researchers. 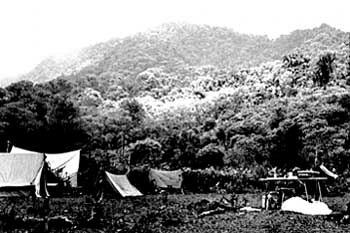 In 1965, Robert Andrle camped at El Triunfo (photo right from Andrle 1967) during his preliminary ornithological survey and study of the Horned Guan. The area is still not very different. 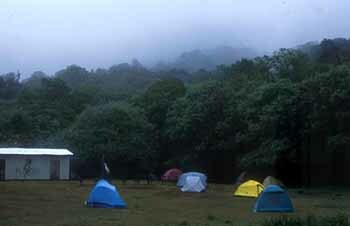 In 1986 (below) we camped in sunny weather but in 2002 (below right) the clouds lowered and we often in fog, and two days were spent in pouring rain and blowing wind. 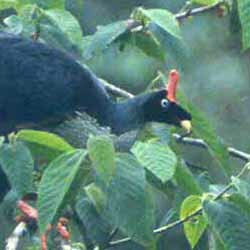 Of course, El Triunfo is best known as holding the world's largest concentration of Horned Guan, a huge, dramatic, and endangered cracid whose entire world range is restricted to isolated cloud forests in Chiapas and adjacent Guatemala. 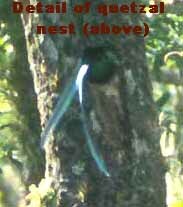 But there are numerous other special and spectacular species at El Triunfo, including the Resplendent Quetzal (top of this page) and the scarce and elusive Black-throated Jay (below). 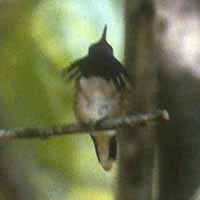 It can be very difficult photographing birds in the dim cloud forest. Some, like the Spotted Nightingale-Thrush (right) are always hidden in the shadows, hopping onto the shady forest trails following army ant columns. 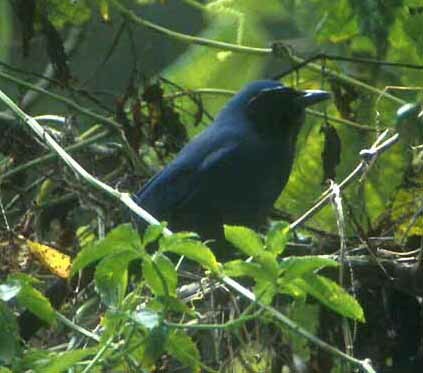 Even more elusive are phantoms like the Scaled Antpitta, Singing Quail, and White-faced Quail-Dove. I feel lucky to just have seen them, and always while walking alone or with just one other person in the forest. Moving quietly and slowly is the secret to success with these skulkers. I did manage a few bird photos, though, on both visits to El Triunfo. 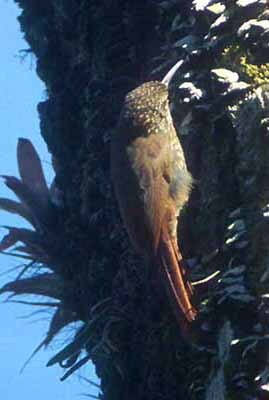 Shown below are Spot-crowned Woodcreeper (below left), Blue-crowned Chlorophonia (below center), male Wine-throated Hummingbird displaying (below right, top; a 1986 photo), and Green-throated Mountain-Gem (below right, bottom). 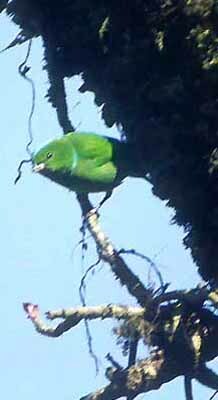 More bird photos are on the El Triunfo introduction page and a complete annotated bird list is also on-line. PHOTOS: The photos are © 2002 Don Roberson (except the 1965 camp photo scanned from Andrle 1967), all rights reserved. Andrle, R. F. 1967. The Horned Guan in Mexico and Guatemala. Condor 69: 93-109.